The Blue City, as it has been coined in recent travel publications, is possibly one of my favorite cities in the entire world! Chefchaouen is a small town in Morocco, located in the Rif Mountains. To get here, that means a LONG drive (or bus ride), a much cooler climate, grey skies, and mostly rainy days. 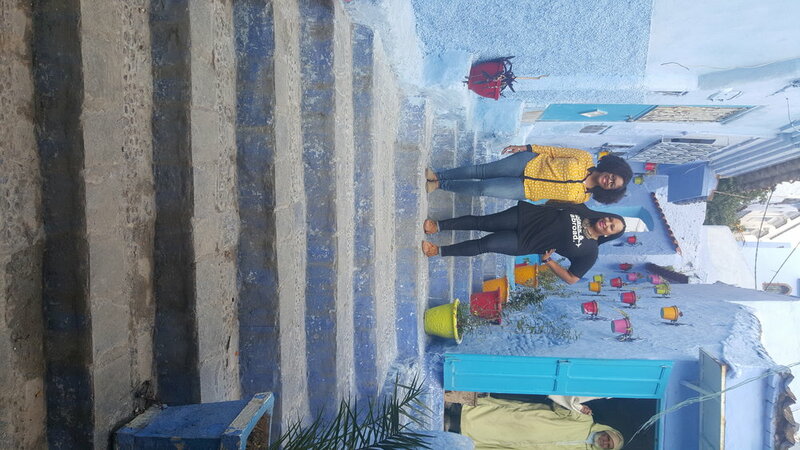 is blue in the Old City! There is a lot of history behind the color. It is said that when Jews inhabited the area (which they no longer do, almost 100% of te residence are Muslim), they introduced the color to the town, which is closely related to the religion. The Blues are also said to have a calming effect on the psyche considering the gloomy skies. The people of Chefchaouen are extremely hospitable, mild tempered, and genuinely pleasant (compared to people in larger cities like Casablanca). I would attribute this to the limited amount of tourism to the region. Because this town is in the mountains and takes a while to get to (~8+ drive from Marrakesh), many may skip this gem. While we did not get an opportunity to stay overnight in Chefchaouen, if you have the opportunity to come to Morocco ADD THIS TO THE LIST! Check out some of the photos from our day in The Blue City! ** All photos were taken by me on my iPhone 5s!